There is no greater force in America than The Brand—and those who disrespect it suffer the consequences. This law was recently demonstrated by the owners Grumpy Cat (née Tardar Sauce), the viral internet superstar with a permanent Clint Eastwood-like scowl, who scored a massive $710,001 payout from a copyright infringement lawsuit. The cat’s owner, Tabatha Bundesen, filed suit against Grenade Beverage in 2015. Bundesen alleged that Grenade Beverage breached the terms of her contract by using the cat’s likeness on T-shirts and Roasted Coffee products. According to the suit, the contract only permitted Grenade Beverage to use the cat’s likeness on “Grumppuccino”-branded iced coffee. 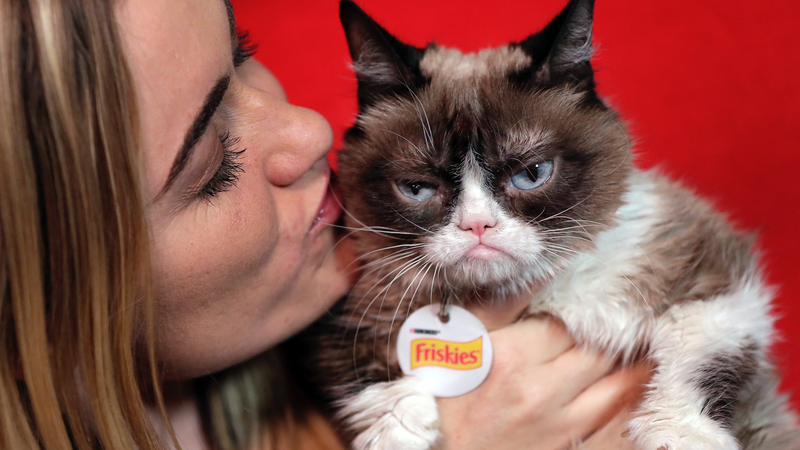 Grumpy Cat Limited initially asked for $600,000 for four alleged acts of infringement, frankly a pittance compared to the value of meme stardom. Grenade countersued Grumpy Cat Limited for $12 million, arguing the brand hadn’t done enough to promote the coffee products. But, the copyright gods, apparently big fans of Tardar Sauce’s cinematic achievements, sided with the nonplussed puss. After a week-long trial, a California jury awarded Grumpy Cat’s owners $710,000 for infringement and $1 for breach of contract. While reproducing images is the point of memes, putting them on products to make money is classic trademark infringement. This is unlikely to change the cat’s countenance, however, as grim frustration is the essence of her appeal.